The KIBO Expression Module is a wonderful add-on to support a variety of literacy activities (write or draw on the whiteboard! ), geography activities (flags of the world! ), or children can design a flag (for their own imaginary country!). 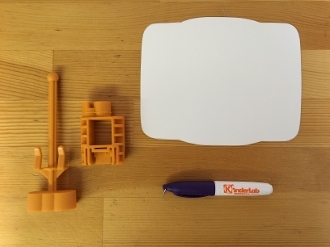 Insert the Whiteboard, flag, or other small paper artwork into the Flagpole, and then insert the Flagpole on top of the Spacer (if you don't want your Flagpole to rotate) or one of your Motor Modules (if you want your Flagpole to rotate--not included, use Motor from your KIBO kit).Then insert the whole assembly into the center motor socket and KIBO becomes an expressive robot! Flags are not included (children make them) and Motor Module is not included (use Motor Module from your KIBO kit, or purchase additional Motor Module separately). * Note, marker colors vary.